There is nothing hard in using the strategy to trade for Rapid Trade Finder. Basically everything is so easy that you can just go ahead and start right away. Now some secret is that is has really nice results in exotic pairs, not the standard one like EurUsd, GbpUsd and so on, but those which are not so common in trading. So let’s start checking how to use this indicator in our trading. First of all you can download it absolutely free – without any cost. So let’s go ahead and check the rules. As usual all you have to do is just go ahead and try the standard strategy which comes with it – the one from below. I will go ahead and place here the entry rules for sell trades. Step 1, cloud is colored red. You have to wait for that. Step 2, wait for price to go inside cloud and close. 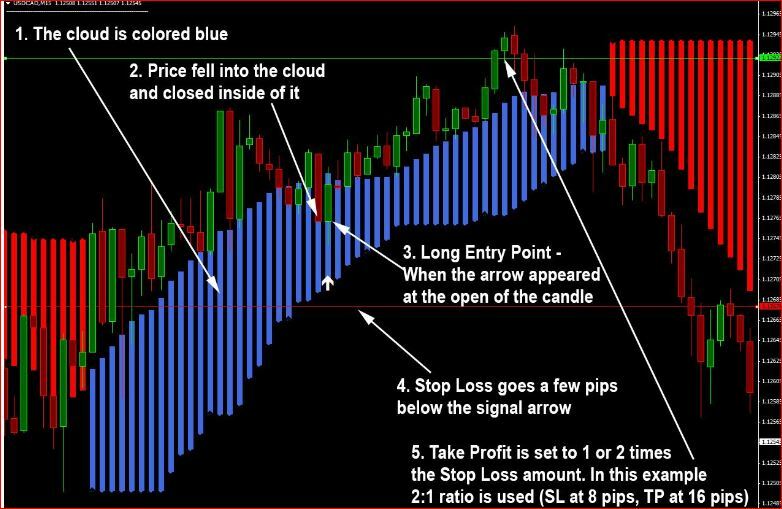 Step 3, as soon as the candle opened and signal arrow appeared, a short trade can be placed. Step 4, Place your SL few pips above the red area. This system is very simple, as you can see, yet very powerful and profitable. Now if you want to increase your chances of being profitable all you have to do is just add some filters into your trading, and that will be just like the one we like – a simple indicator like a trendline break or RSI, or even better for experiences traders is using major support and resistance for confirmation and targets. And also use it on familiar currency pairs and timeframes, and as usual never use while high-impact news release.